The New Year is a great time for reflection and planning, and its also a great time to set things up for the upcoming year. 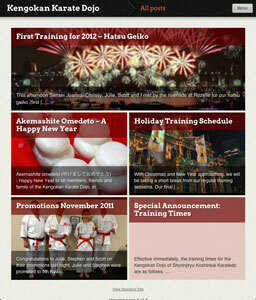 We had our Hatsu Geiko (first training) yesterday, and today I’ve launched the new website for Kengokan in 2012. Actually, most of the content stays the same – if anything, its been updated and expanded. 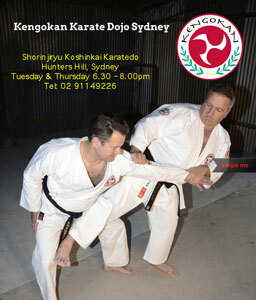 You’ll still find the information on the Kengokan Dojo, Shorinjiryu Koshinkai Karatedo and the arts we practice. The News page is still here, although its renamed as the News / Blog page. This reflects my intention to use this page for not just dojo news, but also to summarise some of our training sessions, perhaps providing/expanding detail of some of the technical or philosophical concepts discussed. This returns the blog part of the site to its original intended purpose. By far the biggest change is the fact that we now have a specially designed interface for the iPad, as well as for smartphones. When you visit Kengokan.com on an iPad, you’ll be recognised, and provided with the special interface that looks more like a magazine, and uses swipe controls to move through pages. I think you’ll like it, but you can always go back to the standard view by clicking the link at the bottom of the page. This website has always been intended as a training support tool for our small band of members. I hope these small changes will improve its usefulness in this.